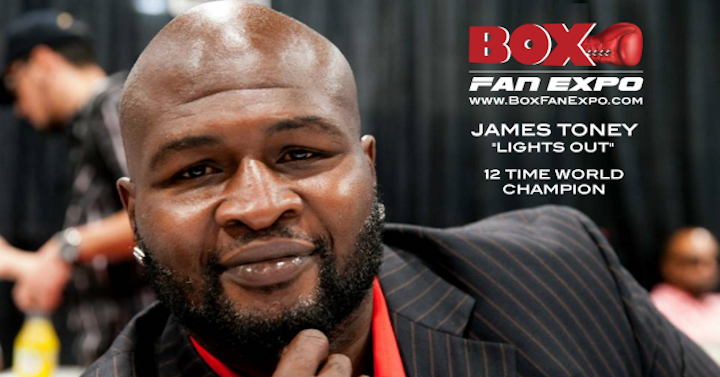 12-Time world champion James “Lights Out” Toney has confirmed that that he will appear and hold a Meet & Greet with his fans at the Las Vegas Convention Center for the fourth Annual Box Fan Expo on Saturday September 15, 2018 from 10am to 5pm, during Mexican Independence Day weekend. The Boxing Expo will also coincide with the highly anticipated rematch between Saul ‘Canelo’ Alvarez vs Gennady ‘GGG’ Golovkin, that will take place later that evening at the T-Mobile Arena. Toney is a former IBF middleweight, super middleweight and cruiserweight world champion. He has been regarded as one of the greatest defensive fighters of his era and was unbeaten in his first 46 contests bouts. Toney has fought at the elite level for more than three decades and is a sure first ballot Hall of Famer. Toney holds notable wins over Michael Nunn, Reggie Johnson, Mike McCallum, Iran Barkley, Vassily Jirov,and Evander Holyfield. With over 90 pro fights in his career, not once has he ever been knocked out and no referee has ever had to save him or stop a fight while competing. Toney was also awarded Ring Magazine and Boxing Writers Association of America Fighter of the Year 1991 and comeback fighter of the year 2003. Toney Joins Mayweather Promotions, WBC, WBA, Thomas Hearns, David Benavidez, José Benavidez, Badou Jack, Mia St.John, Jessie Vargas, Erik Morales and Fernando Vargas as an early commitment to this year’s Box Fan Expo. 4 Division world champion Mikey Garcia has confirmed that that he will appear and hold a Meet & Greet with his fans at the Las Vegas Convention Center for the fourth Annual Box Fan Expo on Saturday September 15, 2018 from 10am to 5pm, during Mexican Independence Day weekend. The Boxing Expo will also coincide with the highly anticipated rematch between Saul ‘Canelo’ Alvarez vs Gennady ‘GGG’ Golovkin, that will take place later that evening at the T-Mobile Arena. Mikey Garcia, is an American professional boxer from Mexican descent with a perfect record of 39-0. He is a world champion in four weight classes and a unified lightweight world champion, having held the WBC title since 2017, and the IBF title since July 2018. Previously he held the WBO and Ring magazine featherweight titles in 2013, the WBO junior lightweight title from 2013 to 2014, and the IBF and lineal light welterweight titles from March to April 2018. On July 28, 2018, Garcia defended his WBC lightweight title and took away the IBF belt from Robert Easter Jr with a wide unanimous decision win, which included a third-round knockdown. More than 12,500 fans were on hand at the Staples Center in Los Angeles to witness this incredible achievement. Garcia is ranked in many organizations amongst some of the best pound for pound Boxers in the world. He is trained by his father Eduardo and his brother, former world champion and one of the top boxing trainers in the world Robert Garcia. A well rounded fighter, Mikey is known as a boxer-puncher with strong fundamentals, formidable punching power, and adaptability. 4-Time world champion Abner Mares has confirmed that he will appear, and hold a Meet & Greet with his fans at the Las Vegas Convention Center for the 4th Annual Box Fan Expo that will take place on Saturday September 15, 2018 from 10am to 5pm, during Mexican Independence Day weekend. The Boxing Expo will also coincide with the highly anticipated rematch between Saul ‘Canelo’ Alvarez vs Gennady ‘GGG’ Golovkin, that will take place later that evening at the T-Mobile Arena.